“I beseech thee for my son Onesimus, whom I have begotten in my bonds which in time past was to thee unprofitable but now profitable to thee and to me” (Philem 10, 11). St. Paul was a prisoner of Christ in Rome. Apparently, Onesimus, a slave of Philemon, had robbed his master and fled to Rome where he was caught and put in the same prison where Paul was imprisoned. By the ministry of Paul, Onesimus got saved. An illiterate slave and thief is adopted by St. Paul. “To the weak became I as weak, that I might gain the weak: I am made all things to all men, that I might by all means save some” (I Cor 9:22). Though Paul was in bonds, he brought freedom to others who were in bonds. Maybe you are not literally in bonds or in prison, but the very situation in your house, family or in your work place may appear to be keeping you in bonds. As in the case of Paul, God might have permitted your “bonds” to bring true freedom to many others. Do you remember what happened the time Paul was thrown into the Philippian jail? See Acts16: 22-33. Your “jailor” too can be saved! The meaning of Onesimus is “profitable”. 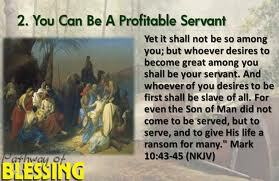 Once he was an unprofitable servant; now that he is saved, he becomes profitable to St. Paul and to his master. A saved person should be a blessing to the spiritual world and to the secular world.